While Bret Bielema continues to dig deeper in the asteroid crater he has already carved into the earth, you have to give him one thing: he keeps being himself. For about the 75th time this season, Bielema’s mouth has bitten off more than it can chew after Saturday’s home loss to a marginal Big 12 opponent in Texas Tech. While the comment was edited for the younger readers in the audience, you catch the drift of Bielema’s approach. After he was called out for that large trap by Tech coach Kliff Kingsbury, Bielema acted like the bully on the playground who can never just admit defeat. Bielema then called Kingsbury out for being sensitive. While the so called “sensitive” Kingsbury is refusing to shoot back, the brave and noble Bielema will not drop the topic after his team failed to show up for a second straight week. He just might have larger fish to fry than a media battle against a supposedly inferior opponent. While it is nice to see the pride Bielema has in his conference, not showing up on the field devalues everything he says. While Bielema is right that the SEC schedule is loaded with ranked teams, this rule remains: If you talk, you cannot fall from the ranks of those squads by week two. Here’s rule number two: You can’t lose two straight home games out of conference, before playing the SEC. Rule number three: See rules 1 and 2. With all of BERT’s big words, it is tough to recall that Arkansas is just 11-17 in the Bielema era with only two SEC wins last season. However, those wins came in two of the last four games, leading to lofty expectations in 2015. With back-to-back home losses against Toledo and Texas Tech, all Bielema is doing is this: He’s setting up the Razorback fan base to turn on him… and others to laugh when that happens. All of this stems from Bielema putting a target on his back — and, instructively, his team — by calling out Ohio State’s schedule. Keep in mind that a handful of years ago, Bielema was basking in the success of playing Northern Iowa, UTEP (whom he also played to open this season), South Dakota, Austin Peay, and San Jose State, just to name a few in his tenure at Wisconsin. Kingsbury noted some comments Bielema made at a coaching clinic in Texas, bashing certain Texas college coaches and their philosophies. Clearly there was some motivation for Kingsbury — a Texan who starred in college as a player; the son of a Texas coach; and now a coach in the Lone Star State himself — to score a double-blow against Bielema and the state of Arkansas, which has a natural rivalry with Texas dating back to the days of the Southwest Conference. Next up for Bielema? Another Texas-based college coach in Kevin Sumlin. You have to think Sumlin will feed off the same personal motivation and make it an even longer season for Bielema. Clearly Kingsbury thinks so. For perspective on this, consider the following: A few years back, Bielema took another shot at an Urban Meyer-coached team, saying he did not want SEC tactics in the Big Ten. Then, of course, BERT orchestrated a Bobby Petrino-style departure to the SEC, and not just to any league school, but to Arkansas, the program Petrino left in ruins with his appalling behavior. Everyone loves someone who is brash, confident, and backs it up. 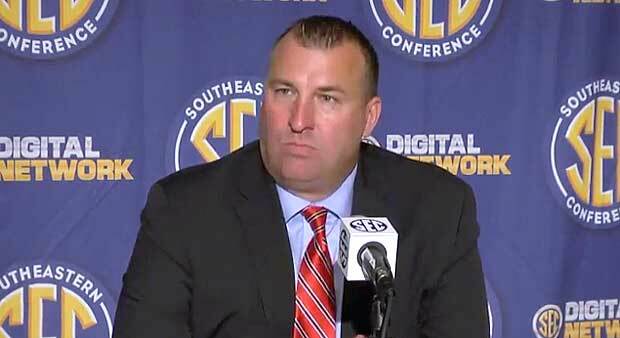 Bielema is learning, though, that the SEC is not the Big Ten on many levels. The success at Wisconsin, you can talk about. The failures at Arkansas, the talk only brings laughter and eventually becomes a joke. The problem at hand for Bielema is that he is flirting with that line, particularly if even Rex Ryan takes his shot at you. With all his talk, Bielema also puts more pressure on his players. To no one’s surprise, Arkansas is now 0-9 in games decided by 10 or fewer points in his tenure. If the constant trolling and the need to reply to every shot that is fired your way continues, it will be interesting to see how long Bielema lasts at Arkansas. The shots will certainly come, and either way, it is clear the Hogs will get everyone’s best each effort week. Good luck, Razorbacks. Good luck… especially if your coach keeps talking big on Mondays and coaching small on Saturdays in the SEC.